Since electric scooter, bicycle, and moped laws change from time to time we recommend visiting your state's DMV website for up to date information. Links to all 50 states and Washington DC's DMV websites are listed below. A driver's license or learners permit is required to drive an electric scooter. No insurance, registration or license plates are required. Driver must wear a bicycle helmet. Drive shall not operate motorized scooter in excesses of 15 mph. Driver shall not operate on public road with a speed limit of 25 mph or more, unless it is operated in a bike lane. Driver to operate on right side of the roadway and next to the curb when feasible. When intending to move left at an intersection, they must walk their scooter in a crosswalk when crossing roadway. Driver must operate in a designated bike lane when one is available. Driver must not ride on any sidewalk except to leave or enter adjacent property. Driver shall not leave scooter on path or sidewalk. Driver shall not hitch scooter onto another vehicle in motion. Driver shall not have passengers. Driver can be on bike path or trail unless prohibited by local ordinance. Driver must have at least one hand on handlebars. White headlight to the front visible from 300 feet both to the front and sides. A red reflector on the rear of the device, visible from 500 feet. White or yellow reflector on each side visible from the front and rear of the device from 200 feet. A white lamp or white lamp combination, attached to the operator and visible from 300 feet in front and from the sides of the motorized scooter. Handlebars must not exceed shoulders of the rider. Scooter must have an engine/motor kill switch that activates when released or when the brakes are applied. Scooter must have a working brake. A driver's license is not required to drive an electric bicycle. Driver shall not operate a motorized bicycle if under 16 years of age. Bicycle must have fully operative pedals. Power output must not be more than 1000 Watt. On level ground must not travel faster than 20mph on motors power only. Electric motor must disengage when brakes are applied or when throttle is released. A driver's license or learners permit is required to drive a moped. No insurance or yearly registration are required. Driver must wear a DOT approved motorcycle helmet. An electric moped is not required to have pedals. On level ground must not travel faster than 30mph on motors power only. In California operating a moped on public roads requires a drivers license or learning permit, a license plate, and a registration card. A moped license plate and registration card costs $18.00 and never expires or needs to be re-registered. Pocket bikes are not allowed on public roads or public areas in California. 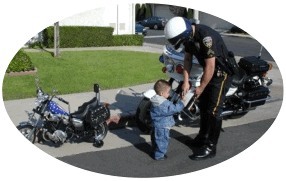 If a pocket bike is operated on a public road or public area law enforcement may ticket the driver and impound the pocket bike for up to 48 hours. California Vehicle Code Section 21720 makes it illegal to operate an electric or gas powered pocket bike on a sidewalk, roadway, or any other part of a highway, or on a bikeway, bicycle path or trail, equestrian trail, hiking or recreational trail, or on public lands open to off-highway motor vehicle use. This law requires the pocket bike manufacturer to provide a disclosure statement to the buyer which clearly indicates where a pocket bike cannot be operated, and it authorizes law enforcement to seize a pocket bike and hold it for 48 hours when the operator is cited for violation of Vehicle Code Section 21720. Three and four wheel mobility scooters may have motors rated up to two horsepower, and they are allowed to travel at speeds up to 30 miles per hours on level ground. This is a motorized mobility scooter law which only applies to senior citizens and people with physical disabilities. Motorized skateboards are not allowed on public roads, sidewalks, bike paths, or hiking trails in California. There was a motorized skateboard craze that started in the mid 1970's and this law was passed because a lot of people were riding them in the streets.